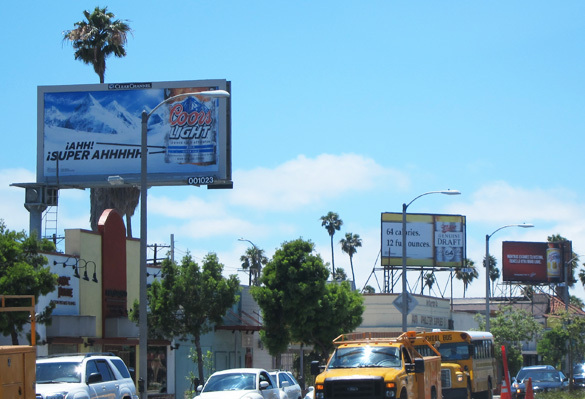 Ever since the L.A. City Planning Commission approved a new sign ordinance requiring the takedown of existing billboards in exchange for the right to put up new ones in special sign districts, business and development interests have lobbied to defang this provision. In the two years since the commission’s action, city planners have steadfastly defended what most community members consider one of the most important elements of the ordinance, but finally they’ve blinked, and the latest draft of the ordinance drives a stake through the heart of the billboard takedown requirement. Not that the planners in charge of the ordinance should be blamed. At the August meeting of the City Council’s Planning and Land Use Management (PLUM) committee, chairman Ed Reyes tossed lobbyists the red meat they wanted by asking the planning staff why “streetscape improvement and beautification” hadn’t been included as an alternative to the billboard takedown requirement. Reyes was either ignorant of, or choose to ignore the fact that the City Planning Commission (CPC) had listened to numerous public comments and discussed the issue at length before deciding that removing existing billboards was the community benefit commensurate with the highly lucrative entitlement for new billboards and supergraphic signs within a sign district. Reyes’s question followed a parade of lobbyists and sign industry representatives to the public microphone, all pointing to ordinance provisions, including the takedown requirement, that they considered too restrictive. And a fundamental fact of city hall life is that when lobbyists speak, politicians generally listen. The ordinance draft released Oct. 5 still contains the provision that new off-site signs in sign districts must be offset by the removal of existing billboards in the surrounding community at a more than one-to-one square footage ratio. As a real-life example, the sign district proposed for the Metro Universal project in North Hollywood calls for more than 60,000 sq. ft. of supergraphic advertising signs. If the takedown requirement was imposed, the developer would have to acquire and remove the equivalent of almost 90 full-sized billboards in the surrounding communities. But now, under the latest draft, the developer could opt for a “Community Benefits Program” that includes such things as sidewalk widening and landscaping, undergrounding of utilities, streetscape and lighting improvements, the installation of murals, the building of public parking structures, and making facade improvements to buildings. The city planning department and CPC would be required to make “findings” that billboard takedown was “infeasible or impractical” and that the public benefits were substantially equivalent to sign reduction. Who’s going to decide what is “infeasible or impractical?” And how equivalency would be determined isn’t specified, most likely because it would be impossible. While comparing the size of an existing billboard to the size of a new sign is an imperfect way of determining relative value, at least it’s an objective measurement. How do you compare the value of widening a sidewalk to the value of a bright, shiny new sign that will beam ads for corporate products and services around the clock for the foreseeable future? Back in 2002, the City Council responded to community pressure and prohibited any new billboards or other forms of off-site advertising. Developers in Hollywood and downtown had already glimpsed the dollars to be made from incorporating advertising signs in their projects, and sign districts were born, along with some euphemistic and obfuscatory language about districts with special character that would benefit from their own unique signage. By the time the City Council approved a motion in late 2008 to rewrite the sign ordinance, it was abundantly clear that sign districts had become a legal way to evade the 2002 ban on new signs, and had next to nothing to do with actual districts and neighborhoods. When the CPC took up the initial draft of the ordinance in January, 2009, some people active in the sign blight wars wanted to call sign districts the spurious pretense that they actually were, and do away with them. It became clear early on that there wasn’t majority support for this position on the CPC, so attention was turned to a billboard takedown requirement as a condition for new signs in sign districts. The promise of the 2002 ban was actually twofold–that new billboards wouldn’t go up, and that existing billboards would come down, through attrition and a process of rooting out illegal ones. So if people had to hold their noses for sign districts, at least the takedown requirement would make billboard proliferation a zero-sum game and be consistent with the spirit of the ban. So much for that spirit, or intention, or the fact that many communities such as the one in the photograph accompanying this article are badly blighted by billboards and would benefit in demonstrable ways by getting rid of something that most often benefits only the billboard company and a single property owner while acting as a detriment to the kind of community improvement that brings more business, more tax revenue, and a better place for everyone. Click here for the full text and other details of the new sign ordinance.